What more can a true Ganesh Bhakt ask for, the blessings of Ganesha will give him lifelong peace and happiness. He will never have to struggle and strive to get anything, all his needs will be fulfilled, he will always be protected from dangers, accidents and enemies. This Shri Ganesh Mantra Sadhana has to be practiced for 31 days. The Mantra Sadhana can be started on any auspicious occasion like a Sankashti Chaturthi, which falls every month or on any Wednesday. 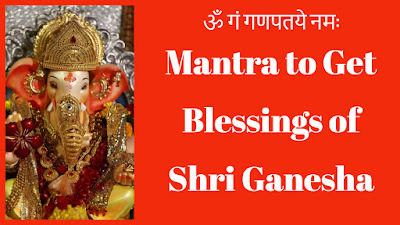 The practitioner should sit down comfortably facing the East Direction and chant this Ganesh Mantra, which is given below for 21 Malas or 2268 Mantra Chants. The practitioner can use a Sandalwood, Coral Beads or Rudraksha Japa Mala for counting the number of Mantra Chants. Note- There must be no break in the Mantra Chanting and it must be done continuously using the same procedure for all the 31 days. If the practitioner desires, he can worship Ganesha by offering Dhoop, Diya and Red Colored Flowers. Only women can discontinue the Mantra Sadhana during their Monthly Cycle and continue from where they discontinued. The wordings in the Mantra are correct.